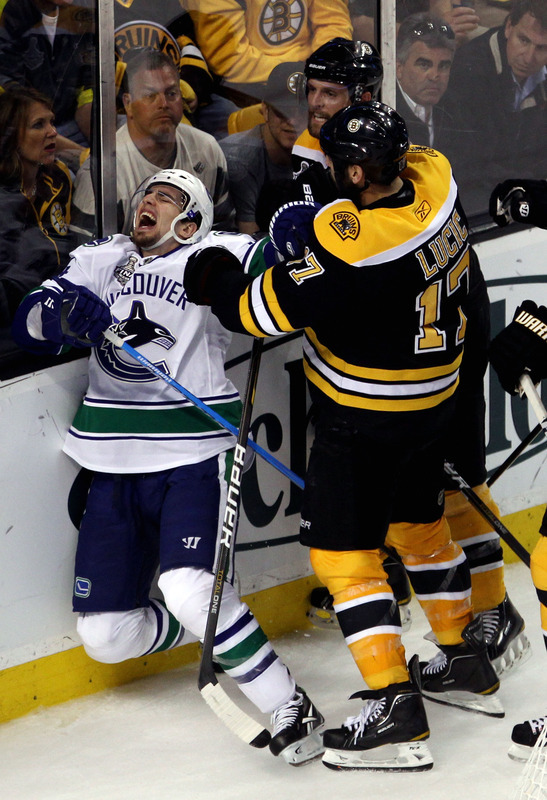 The Bruins, fed up with the Canucks confidence and antics beat and beat up the Canucks in Game 3 cruising to a 8-1 win in Game 3 behind two-goal games from Mark Recchi and Michael Ryder. The outburst started after a late hit by Aaron Rome knocked Nathan Horton out of the game with a cheap shot. From there the Bruins took it to the Canucks and scored goals in every way possible, including two shorthanded goals. Lost in the shuffle was a great game by Tim Thomas who made 40-saves and a great effort by the penalty-kill who killed off eight power-plays by the Canucks and potted two shorties. Keen on getting the Canucks out of their comfort zone the Bruins came out hitting the Canucks forwards. The play seemed to get under the Canucks skin and Aaron Rome ended up taking a run at Nathan Horton, hitting him well after he released the puck and knocking Horton out on the ice, his body going stiff and gasping for air, emblematic of the worst of the knockouts. Rome was given the gate, a five-minute interference call and Horton had to be placed on a cart. After a lengthy delay play resumed with a five-minute power-play for the Bruins. Despite nearly all five minutes being held in the Canucks zone the Vancouver killers came through huge with blocked passes, shots and sound positioning. Roberto Luongo would come up with six saves, most positional during the lengthy power-play. Luongo also ate up some shots with traffic in front, preventing rebounds in key situations. Vancouver responded with some pressure and eventually Adam McQuaid was forced to commit a delay of game, giving the Canucks, who already had momentum from a big kill, a great chance to get an early lead. The Bruins would respond with a good kill themselves, keeping the dangerous parts of the Canucks offense at bay. Both teams played some intense five-on-five hockey in the final part of the period with the teams trading possession but the Canucks finding the better of the few good chances in the first period but like all first periods in the series, neither team could break through for a goal. The Bruins got a fortunate goal just seconds into the second period when a shot from the point went in. Alex Edler broke his stick in his own zone, David Krejci stole and eventually the puck went around the zone and came to Andrew Ference at the corner of the blue line. Ference skated into a one-timer and the puck found it’s way through Edler, who seemed to try to bat it away, and above Luongo’s glove. A few minutes later Shawn Thornton drew a hooking call when he was in deep, getting a shot off before the play was stopped by the call. The Bruins power-play looked good and was awarded with a goal with a make-shift power-play corps. Michael Ryder got the puck on the half boards then went cross-ice to Mark Recchi. Recchi then through it to Rich Peverley out front but Ryan Kesler‘s stick got in the way and deflected it under Luongo’s five-hole. Kesler was caught watching the point and anticipated d-to-d and was late getting back down low. The Canucks would soon after get a power-play of their own when Ference took a lazy penalty tripping up Alex Burrows. The Canucks once again had some great passing but none too confusing for Tim Thomas who made some great side-to-side saves. The Bruins kill also had some offensive moments to take the pressure off. Milan Lucic would put his team back down a man with a slashing penalty with nothing going on. The Bruins began the penalty with some great work in the Canucks zone and eventually it culminated in a Brad Marchand goal on a great individual effort, beating Kesler one-on-one. Marchand fought off a check in the neutral zone, put his head down and streaked towards the net and across it before Luongo went to his stomach and Marchand ripped it over the prone goaltender. The Bruins would get the fourth goal of the game after a tremendous shift by the fourth line lead directly into a David Krejci goal. Michael Ryder took the puck in the zone dragged back and put a shot on Luongo. Luongo couldn’t glove the puck down and left a juicy rebound out front. David Krejci skated into it and ripped a shot high glove side for the goal. With under 2:30 left Johnny Boychuk was called for high-sticking and he earned it. The vicious high stick was enough to get four minutes, giving the Canucks a great chance to cut into the lead before the final break. The Bruins rallied and killed off the first part of the penalty but took about 90 seconds of penalty time to the intermission. The Canucks entered the period with 94 seconds of power-play time but the Bruins penalty-kill killed it off without much worry, obstructing the Canucks in all three zones. The Bruins would go back on the penalty-kill shortly after when Michael Ryder laid a high hit on Andrew Alberts along the boards, giving the Canucks their sixth power-play of the game. During the power-play both Burrows and Zdeno Chara were sent off when the two whacked at each other on the faceoff. The Bruins would kill off the penalty, this one being more possessive by the Canucks but not more productive. Daniel Sedin and Andrew Ference would get tangled up after Sedin hit Ference on an icing which got each player two minutes in an ensuing scrum. Sedin, almost remarkably hit Ference, missed, and then flopped looking for a call on Ference. Both players were giving 10 minutes as the referees looked to combat the cheap stuff. After a turnover down low Tim Thomas made a big save on Chris Higgins and Shawn Thornton got into some rough stuff with with Kesler, got two and 10 and walked down the runway as the referees took the game over. Ryan Kesler would nullify the power-play he drew when he was shown the penalty box after taking a run out of frustration. As the penalty expired Chris Higgins got a breakaway, went five-hole but Thomas sticked it away to keep Vancouver scoreless. Milan Lucic eventually got into it with Burrows after a post-whistle scrum ensued, punching Burrows with his glove then taunting Burrows by sticking his exposed finger in Burrows face. During a television timeout Dennis Seidenberg fought Ryan Kesler, a one-punch fight where both players fell down rather easily. From all the business the Canucks got another power-play, their seventh of the game but the Bruins scored their second shorty of the night when Daniel Paille beat a Canuck to the net before putting a shot on goal, the weak shot squeaking past Luongo near his glove. The Bruins killed off the rest of the penalty pretty easily and took a 5-0 lead into the final seven minutes. Jannik Hansen would get the Canucks on the board after a nice bit of passing ended with Hansen getting a pass with Thomas out of position and helpless. The Canucks worked a triangle from behind the net, going left from behind the net then quickly to the opposite side of the net and in quickly. The Bruins would get a sixth goal after a failed 2-on-1 turned into a Mark Recchi goal, his second of the night when Marchand corralled the puck that jumped over his stick and fed it out front to Recchi who popped it past Luongo. Chris Kelly would add another goal a minute or so later when the Bruins won a puck battle behind the net and a loose puck got out front where Kelly popped it past Luongo who had stretched and whiffed when trying to freeze the puck. He couldn’t get back and Kelly got the easy one. Raffi Torres would take a run at Boychuk behind the Bruins net and would spend the final 1:07 in the box. Well not exactly, Michael Ryder would rip home a goal with 30 seconds left, skating freely to the dot and beating a screened Luongo for the Bruins third goal on three consecutive shots. The wild third period would end with the the Canucks ragging the puck, content to go home without any more fight.